The oldest and most prestigious hotel in Bologna, Grand Hotel Majestic oozes a classical Italian style and boasts exquisite views across the city. We can totally see why it’s the best. Centrally located, the Grand hotel Majestic is a stone’s throw away from the Piazza Maggiore and the famous Duo Torri, lending itself the perfect place to stay for a culture packed weekend in Bologna. 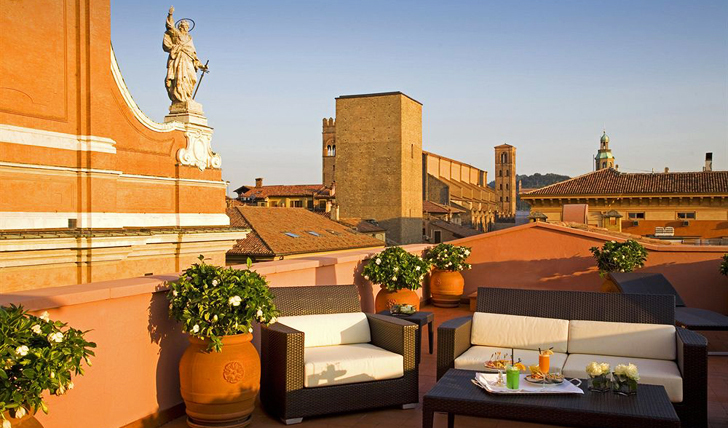 Built in an 18th Century palazzo, the hotel boasts views across the city and along the ancient roman road; you will be forgiven for forgetting you live in the present day. 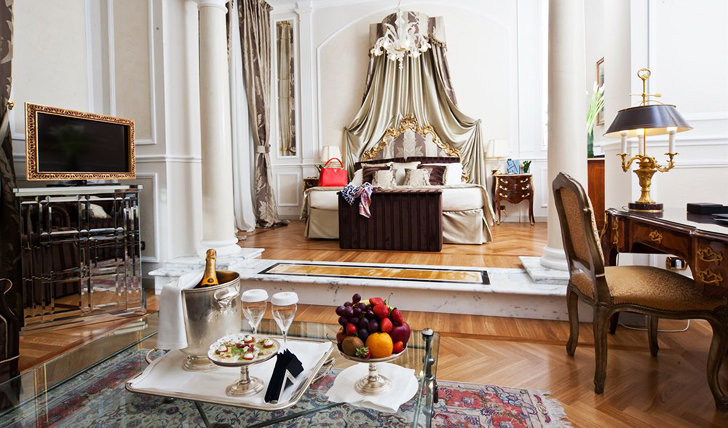 All of the rooms have a distinctly aristocratic feel to them, with sumptuous marble bathrooms, antique features and huge beds, you’re sure to feel a part of the Italian aristocracy by the end of your stay. The rooftop terrace suite is Art Deco in style and boasts the finest views across the city. For a truly decadent stay in the food capital we think you should stay in the suite and make use of your privately accessed lift and concierge service. The I Carracci restaurant might just be one of the most beautiful restaurants we’ve ever experienced. Not only is the food delicious (naturally, we are in Bologna after all) you simply have to look up and gaze at the painted ceiling; these are some of the finest frescoes in Bologna. A riot of food and art? We’ll get involved with that, please.